Strolling through the gates Køpi this past weekend, one might have seen a building with a crumbling facade, dreadlocked masses drinking beer and chainsmoking cigarettes, and artists welding creative bicycle mutants for the Bike Wars that would take place during the weekend’s Karneval der Kulturen. The atmosphere was a bit surreal, but oddly suitable for the lineup of the evening: doom metal acts Samothrace and Bell Witch. Both bands hail from Seattle, Wash., and create a wall of aggressive sound with their own crafted brand of sludgy and churning doom metal. However, the real action doesn’t happen in the courtyard of the legalized squat; the audience must walk down the dimly lit staircase and into the stone cellar to have their eardrums pleasantly assaulted by this Pacific Northwest lineup. The audience was a little slow in trickling in, but the bands were also a little slow to load in. Bell Witch, a doom metal duo, set up first. Adrian Guerra took his place behind the drums as Dylan Desmond took his place at stage left with a bass guitar and a microphone. The setup seemed minimalistic, but the sound produced was anything but. The two band members share the responsibility of vocals with Guerra producing an intimidating growl and Desmond creating a soothing vocal counterpart: it is a hypnotic waltz between doom metal and a dream. 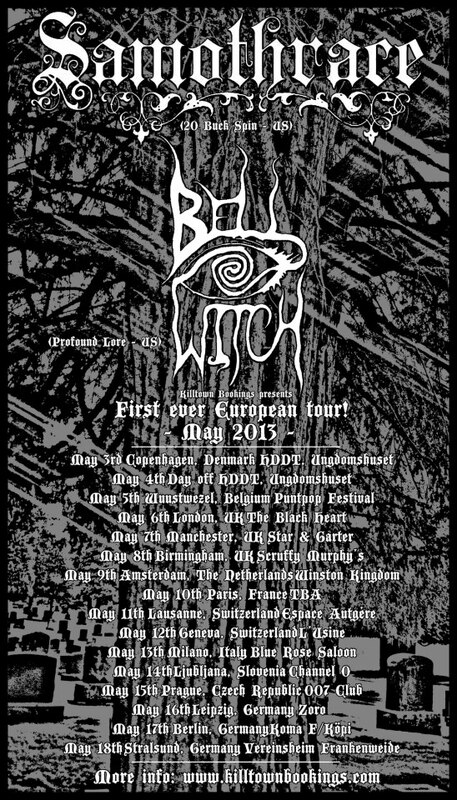 This European tour celebrated the release of Bell Witch’s newest LP, Longing, out on Profound Lore. A drum and bass duo can be a turnoff in theory, but not in this case. The energy that they created between the two of them didn’t leave much room for doubt. There wasn’t much stage banter throughout the set – just enough for the two to introduce themselves and say hello to the faces staring back at them. And there didn’t need to be; the pounding bass and morose melodies were enough to keep anyone entranced. Next up was Samothrace, the evening’s headliners and the obvious crowd favorite. The crowd didn’t move between sets except to step back from three people who claimed extra space for themselves to slosh their beer and allow their dreadlocks to take flight. Meanwhile, there was a sense of anticipation as Joe Axler set up his drums and impressive collection of cymbals on stage, while Desmond stayed put to pull a bit of double duty. Renata Castagna carried in her guitar equipment through a crowd that didn’t wish to be parted, and though small in stature, Castagna held her own in both pushing toward the stage and performing during the crushing set of Samothrace. Bryan Spinks didn’t stick around much before the set, but took his place as the music began to quietly rumble. Samothrace is all about balance, especially during their live set. On the album, Reverence in Stone, though skillfully and meticulously crafted, the actual art of the music gets a little lost in the recording. Live, there is an obvious and well-tuned play (or perhaps battle) between dynamics, melodies, and rhythms. The bass and the drums overpower the riffs that slowly find their way among the physical barrier the low end creates. Samothrace belong in a live environment; a larger sound system than most have on their computers or in their bedrooms is needed for this to boom through one’s soul and make a lasting impression. With every rising of Axler’s arms and the following crash that landed on the cymbals, the audience understood the sludgy textures and winding notes. At the end of the night, the crowd lingered and looked a bit stunned. It only cost five euros (and maybe an extra two for a Pilsner) to be shell-shocked by a healthy dose of doom metal with threads of blues and ambient drone undertones that left most wanting more. This entry was posted in Show Review and tagged American, Bell Witch, Køpi, samothrace, Show Review. Bookmark the permalink.